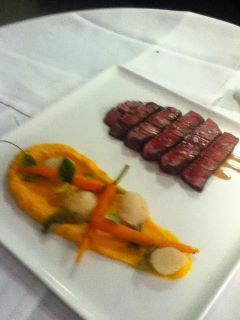 Who Says We Dont Have Quality Beef In New England? Its amazing to me that when I tell people that we are serving beef raised right here in New England that they look at me like I have 10 heads. Now I'm not claiming that we have an abundance of local beef, but in my opinion the beef that I have sourced is by far some of the tastiest & tender I have ever had the pleasure of working with. We here in New England are very lucky, our agriculture industry is growing at a pace that no one ever thought it would. In fact Massachusetts has even had meetings with the public about too many farmers markets popping up and not enough people to frequent them. Crazy huh?! Prices have started to drop at farmers markets therefore making it an option that all of us can afford . I digress as usual, let me get back to BEEF... Whether you are looking for a 100% grassfed product, grain finished or superior Black Angus beef , New England has got it! As New Englanders we need to continue to develop a network that allows us to be self sufficient by growing more foods of our own. But one problem and probably one of the reasons that you have to search high & low and pay a premium for local land based proteins is that we do not have many slaughter houses here in New England. We have approximately 30 slaughter houses, where a state like Wisconsin has well over 200 slaughter houses. Two of my favorite and both represented on my menus currently are, Archer Angus out of Chesterville, Maine and Blackbird Farms in Smithfield, Rhode Island. Both raise some amazing 100% Black Angus cattle, while Archer is almost 100% grass fed ( they work together with a co-op of farmers and some of the ground beef is grain finished) Blackbird uses a combination, raised on pasture their grass diet is supplemented with grain, including corn, hay and essential minerals. two very different flavor profiles and fat content, both have the best beef in New England hands down! No hormones are injected nor fed to either of the farms animals. Traceability you wonder? They both have that covered as well! They can tell you the pedigree, birthday, how it was raised, harvest date & carcass grade. Like most farms in our area, both are family run, both take time to build relationships with their customers and both care about the animals as much as their own pets. And their is even a connection, Ray & Linda Buck ( Archer Angus) even told me that he has selected breed-leading Angus from several well-known cow families......And one of those cow families, well it is Anne Marie & the Bouthillette family ( Blackbird Farms). Where can you find this beef? Well first off you can taste Archer Angus anywhere I am cooking, and several other fine restaurants from Maine all the way down to a few of us in Boston lucky enough to have developed this friendship. Blackbird Farms Beef & Chicken is on my menu as well, and south through Rhode Island you can find it at the best restaurants and retail shops in Rhode Island. To locate restaurants serving Blackbird Beef click here. Blackbird also runs a seasonal farm stand that sells not only their beef, but eggs, chickens ( only chickens I use) turkey and other fine products produced in Rhode Island. Cooking classes? Well they have those as well. Gulf Of Maine Cod: Fuzzy Science or Fisherman Know Best? Word on the docks is that the Federal Regulators are considering shutting down the Atlantic Cod fishery in the Gulf Of Maine?! WHAT WAS THAT?!!! Could the unthinkable here in New England be more of a reality than a myth? One thing is for sure, scientists are extremely concerned about the stocks in the waters from North Cape Cod all the way up through Canada. 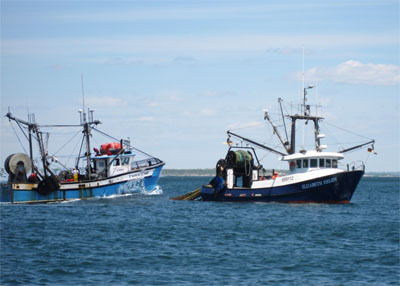 Researchers say that the last assessment in 2008 showed the Gulf Of Maine cod stock was well on its way to recovery and if the pace was kept up, the fishery would reach its goal of rebuilding the code stock by 2014. But a recent assessment says those numbers could have been wrong. And that today the stock is only at about 20% of of the original rebuilding target. Fisherman on the other hand.......well lets just say that they are claiming there nets are full, that there are plenty of cod in our waters. Which according to some scientists can mean one of two things, plenty of fish or plenty of fisherman who are very good at catching the cod that are in the waters. 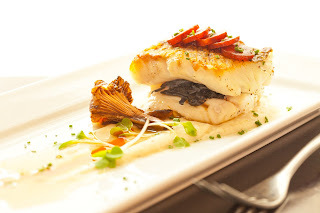 I am torn to be honest with you, some years the news is great and I am excited to put cod back on my menus , celebrating a Massachusetts fishery that has such a prominent identity in our local history. Other years the news is bad, we pull cod off the menus, scrutinize every delivery and every vendor asking whether it was at least caught with true hook & line vs. a net. Wondering when you'll get the call from the media calling you out. You just don't know who to believe these days. Not that I feel any of them are lying, its just hard to believe anyone when the "facts" from each party is so far opposite of the other. One thing is for sure, regulations with more restrictions than ever before are eminent, if the fishery if not a total shut down, NOAA is suggesting that it is too early to make that type of decision and they have many steps before it gets to a full closure. But some of my conversations with fisherman & women from Point Judith to Portsmouth NH are telling me that regulators have started to hint at 90% reduction in quotas that could possibly be in effect this year for the Gulf Of Maine. 90%! Talk about hurting the local economy and the lively hood of those who know nothing else but cod fishing. As a chef I find it to be our responsibility to support the efforts of both scientists and the fisherman, but I ask one favor......Align yourselves and make decisions that will help EVERYONE. I don't ever want to see our local Cod fishery go away, I also don't want to see some of my friends loose their livelihood. This is a perfect opportunity to support other local ground fish like Pollock & hake or other species like sea robin and pan fish, black sea bass and bluefish. In order to keep our fisherman and women fishing, we have to educate our guests on these other species, reduce our need for those species in danger and increase our desire for those species that are abundant and that can help keep our captains and crews STAY out on the water. In conjunction with this years Boston Wine Expo, I am very pleased to announce that Alexander Valley Vineyards & 606 Congress will be teaming up to bring you a cant be missed wine dinner where we showcase local Modern New England cuisine with some of the vineyards finest selections. A great way to start your wine tasting weekend! Seats can be reserved by calling 617-476-5606 and the cost of this amazing evening is only $60 plus tax & gratuity.